Rapid Android for Collecting Market Information? I came across an interview, prepared by Ms. Katrine Veclas from MobileActive, with Mr. Jonathan Jackson of Dimagi. The interview introduces the Rapid Android technology which offers an innovative way of configuring the back-end of SMS deployments. Mr. Jonathan Jackson, summarises the currently available deployment options as including deployments via international SMS gateways and localised deployments. Under the first option the deployment path consists of: 1) clients sending SMS to an international phone number 2) messages are transferred to an international SMS gateway 3) message go through the Internet to a Web server 4) client machines are able to access the Web server through the Internet to view the data. This deployment option is great for large scale applications. 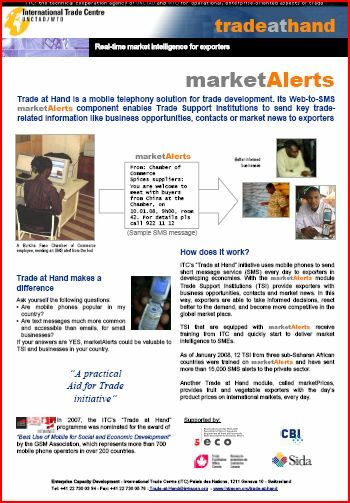 In the area of dissemination and collection of mobile market information, I am aware of ITC’s Trade at Hand using similar deployment paths for the delivery of Market Alerts from trade support institutions to networks of exporters, and for the collection and analysis of local market information under the mCollect project. The second deployment option mentioned by Mr. Jonathan Jackson includes 1) local server connected to a phone, being able to talk to local clients and 2) client machines hitting the local server directly, or through the Internet. Small deployments are viable under this option. But deployments are subject to the hazards of thier small scale. Even small problems with the systems can become critical because they require specialised engineering skills. Such deployments are at risk of losing users’ interest when qualified support is not available on the ground. 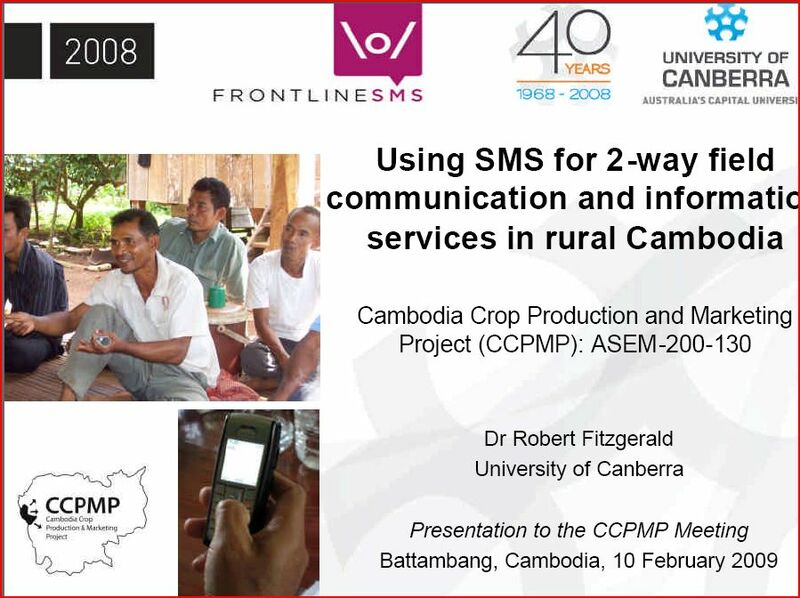 A market oriented project which might fall under this category is the Cambodia Crop Production and Marketing Project (CCPMP). The Rapid Android technology presented my Mr. Jonathan Jackson allows for the use of Android phones not only as SMS clients, but also as back-end servers. This dual use greatly simplifies the equipment needs and the skill needs for the deployment of SMS solutions. It also allows for immediate analysis of incoming data in real time. For the sector of mobile market information systems, Rapid Android presents enhanced SMS broadcasting and data collection opportunities. With the future developments of Rapid Android outlined by Mr. Jonathan Jackson under wasy, Rapid Android presents the opportunity to develop more resilient and extensive market infromation collection networks. Even though the benefits of broadcasting up-to-date market informatiton to farmers in remote areas have been widely recognised. I think more efforts are needed to improve the market information generation process and to ensure the quality of the information. So far the accuracy of the collected information is largely due to the skills and experience of market ennumerators based out in the field. The transformation, analysis and response to this information is tends to be removed at central head offices and headquarters. With the availability of technologies similar to Rapid Android, the opportunity of relocating the analysis closer to the source of the data opens up. Mira – thanks for this! You raise some great points, and I like your connection to gathering market information. Rapid Android is one app in the plethora of tools that can be used for data collection — and overview of some of them is here: http://mobileactive.org/new-resource-using-mobile-phones-data-collection. There is much potential, especially with a new crop of open source tools that can be adapted to varying use cases in the field. Check out the Open Mobile Consortium as well in this regard — http://open-mobile.org. And I hope we will meet one of these days – I hear great things about you!